Oscar’s Big Night: Rangers rookie Oscar Lindberg scored his first NHL goal highlighting a Blueshirts 3-2 win over the defending Cup champion Blackhawks. On a emotional night in Chicago, the Rangers raised the Blackhawks two to win an exciting season opener 3-2. Prior to the game, the Hawks celebrated their third Stanley Cup in six years with a banner ceremony complete with the Cup. That had to motivate the Rangers who not surprisingly came out fast with rookie Oscar Lindberg scoring his first NHL goal. On the play, J.T. Miller fed him for a beautiful one-timer past Corey Crawford at 1:43. Ex-Hawk Viktor Stalberg picked up an assist for his first point as a Blueshirt. Indeed, the new third line was very effective. The trio of Lindberg, Miller and Stalberg combined for a goal and three helpers while each finishing plus-two. In 19 shifts, Lindberg went 6-for-9 on face-offs. Following a goal from exciting new Hawk Artemi Panarin that tied the score, the Rangers responded 2:14 later when Kevin Klein one-timed a Keith Yandle pass by Crawford on a delayed penalty. Miller started it by working the puck to Yandle at the point who threaded the needle for Klein’s first of the season at 16:38. With the momentum, they weren’t done. A great rush from Chris Kreider resulted in Kevin Hayes nearly getting his first. After his near miss, Derek Stepan got to the loose change and deposited it into an open net for his first to give the Rangers a 3-1 lead with under a minute left in the first period. Kreider was flying all night as was Stepan. Hayes looked better than the preseason meshing well with his new line mates on the wing. He also won all five draws. It was mostly Hawks in the second and third. After a sluggish start probably due to the Cup hangover, they started to carry the play. In particular, their new top two lines gave the Rangers fits. Kane played on one line with Panarin and familiar face Artem Anisimov, who donned a new number 15. Every shift they were out, they had the Rangers D on their heels. Particularly Kane and the elusive Panarin, who is gonna have a season. When Chicago coach Joel Quenneville didn’t have the Kane unit out, he sent over his captain Jonathan Toews with Marian Hossa and another young talented player named Teuvo Teravainen. Every bit as dangerous, Toews and Hossa combined to set up Teravainen’s first at 6:55 cutting the deficit to 3-2 in the second. Taking advantage of a Dan Girardi turnover, Toews intercepted a poor clear attempt and passed down low for Hossa, who quickly found Teravainen all alone for a sweet one-time finish past Henrik Lundqvist. 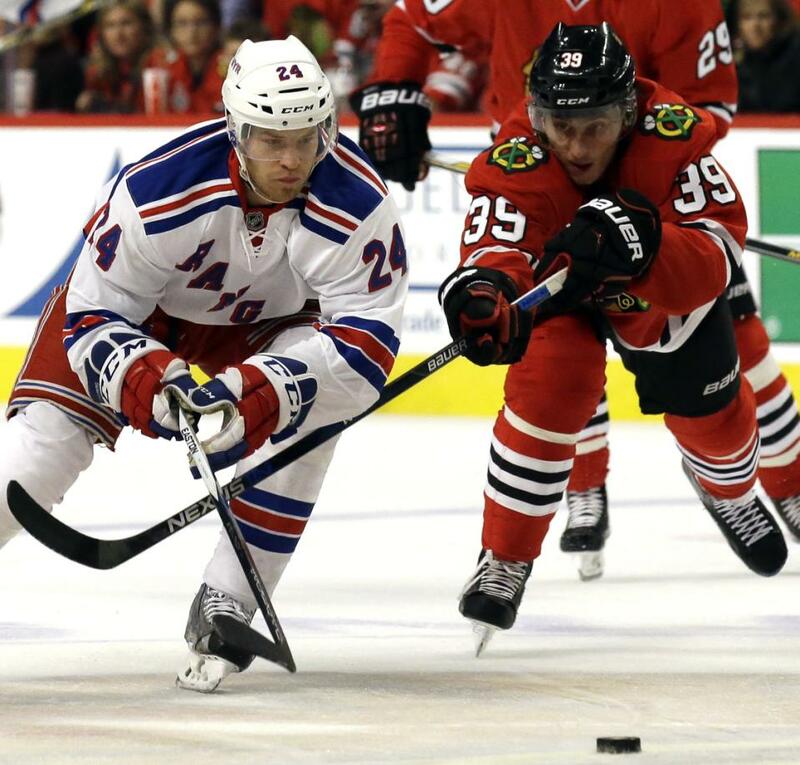 The Blackhawks searched for more in a lopsided third in which they doubled up the Rangers in shots 14-7. With Quenneville shortening his bench by double shifting his stars, they controlled long stretches of the period with sustained pressure in the offensive zone. The Rangers had one good chance created by the hustle of Mats Zuccarello. Easily the best player on the top line, he made a diving keep that led to a Rick Nash break in only to see Crawford rob him with 1:53 left in regulation. The difference was Lundqvist, who turned them away time and time again. He made some big ones late including a stone job on Toews with 1:11 remaining. On the play, Toews pushed Girardi aside and took a pass and was thwarted by a Lundqvist pad stop. Just as Kane poked it free for an apparent goal, referee Steve Kozari was in the motion of blowing his whistle. Losing sight of the puck, he blew the play dead waving off the goal to groans from the United Center capacity crowd. It was reviewed but Kozari determined that the play was “inconclusive” due to the intent to blow rule upholding the decision. For the Blueshirts, they caught a break. However, Lundqvist did stop Toews’ original shot and the puck wasn’t visible. Had Kane got to it sooner, there’d have been the first 3-on-3 overtime. The Hawks still nearly tied it only to see Lundqvist make a glove save robbing Hossa. He also denied Kane on a backhand chance finishing with 32 saves to earn the victory. With Dan Boyle struggling at even strength with partner Marc Staal, Vigneault made a key change late teaming Klein with Staal while Boyle worked with Yandle. The move paid off with Klein making a couple of key defensive plays in crunch time. … Ryan McDonagh took a puck to the jaw and was helped off the ice by Rangers trainer Jim Ramsay. Fortunately, McDonagh was okay returning for his next shift. Neither he nor Girardi has particularly strong nights on for a goal against. However, they were out for big shifts late against the Hawks best. … Crawford finished with 24 saves in 58:15 before being pulled for an extra attacker. … There was only one power play with the Hawks going 0-for-1. The teams skated four aside briefly due to matching roughs between Yandle and Hawks pest Andrew Shaw with 1:19 left in the third. The Hawks had a 5-on-4 with Crawford on the bench coming oh so close. 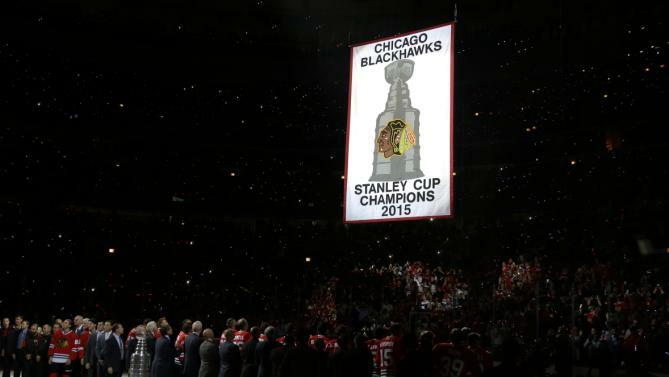 The Blackhawks raised their Stanley Cup banner before the Season Opener against the Rangers who spoiled the party winning 3-2 at the United Center. This entry was posted in NYRangers and tagged Alain Vigneault, Artem Anisimov, Artemi Panarin, Blackhawks, Chris Kreider, Corey Crawford, Dan Girardi, Derek Stepan, Henrik Lundqvist, Jarret Stoll, Joel Quenneville, Jonathan Toews, JT Miller, Keith Yandle, Kevin Hayes, Kevin Klein, Marian Hossa, Mats Zuccarello, NY Rangers, Oscar Lindberg, Patrick Kane, Ryan McDonagh, Season Opener, Teuvo Teravainen, Viktor Stalberg. Bookmark the permalink.